Via Appia "Regina Viarum" is part of the Tentative list of Italy in order to qualify for inclusion in the World Heritage List. Map of Via Appia "Regina Viarum"
The Via Appia was the first and one of the most important road systems built by the ancient Romans. I'm not sure whether Italy will ever submit this tentative site for inscription, if so, certainly the entire road network will be included. During our trip to Rome in November 2013, we visited the Via Appia Antica, a 16 km long section of the ancient road starting at the Porta San Sebastiano. Actually we wanted to visit only the Catacombs of Callixtus, but the weather was warm and sunny, so we decided to rent bicycles and to explore a stretch of the ancient road. There is a tourist information (Via Appia Antica 58), where we rented the bikes and picked up a map showing the monuments along the road, the bus 118 (from metro Circo Massimo) stops in front of the tourist information. The first section of the Via Appia is a busy street, the scenic part begins at the church of San Sebastiano. From there, the car traffic is restricted to residents. We enjoyed our bicycle ride, you have to drive slowly, because there are bumpy cobblestones throughout or you have to use the green strip along the road. We rented mountain bikes, a good decision. There is still the ancient paving in some sections, you can see the deep grooves from the wheels of the heavy waggons (photo). In ancient Rome, it was forbidden to bury the dead in the city, so the tombs were built along the main roads outside the city walls. The remains are often just overgrown ruins or single grave stones with ornaments and reliefs. But there are also larger buildings, like the Tomb of Caecilia Metella or the Villa dei Quintili. Elsewhere these monuments would be top tourist attractions, but in Rome they are nothing exceptional. The special charm of the Via Appia Antica is that it is like an open-air museum, a long row of tombs, mausoleums and grave stones in different shapes and sizes. We turned after about 12 km at the crossing with the Via di Fioranello. Finally, we visited the Catacomb of Callixtus, they are considered the most important in Rome, mainly because it contains also the tombs of several popes from the 2nd to 4th century. It is a huge labyrinth of underground tunnels on several levels. Some graves are decorated with biblical scenes and early Christian symbols such as the fish or the dove with an olive branch. The guided tour (approximately 45 minutes) goes through a part of the complex, including the Crypt of the Popes. 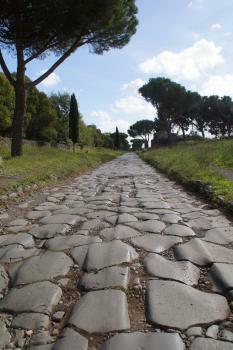 The Via Appia is a worthwhile trip, if you have some time left and want to escape the busy city centre. Unesco Website: Via Appia "Regina Viarum"